Private equity and real estate managers once again are acquiring real estate investment trusts and taking them private, a popular pre-crisis investment strategy. The Blackstone Group LP has been the most active, taking four REITs private so far this year. But Blackstone is not the only firm with REIT acquisition fever. In March, real estate manager Brookfield Property Partners LP acquired the 66% of retail REIT GGP Inc. that Brookfield didn't already own in a deal worth $27.2 billion. Greystar Real Estate Partners LLC reportedly is in discussions to acquire Education Realty Trust Inc., a student-housing REIT. Merger and acquisition activity appears to be headed for the pitch of 2007, the year Blackstone paid $39 billion to acquire Equity Office Properties Trust, the largest REIT privatization at the time. That deal accounted for the majority of the $87 billion in public-to-private REIT acquisitions in the U.S. that year, according to data from Nareit, the Washington-based trade group formerly known as the National Association of Real Estate Investment Trusts. In the first five months of this year, just two deals — Brookfield's GGP acquisition and Blackstone's purchase of Gramercy Property Trust Inc. in May for $7.6 billion — accounted for much of the $49 billion in U.S. REIT merger and acquisition activity. 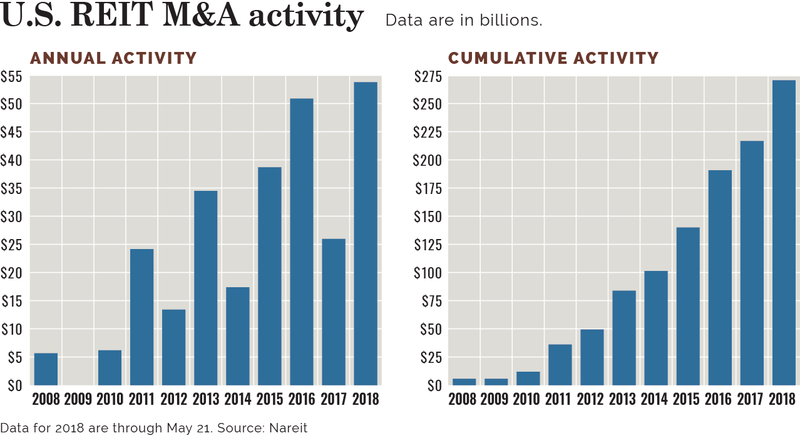 Total M&A activity so far this year far exceeds the $27 billion in all of 2017. Driving this activity is the big difference between the public and private valuations of real estate, and that private equity and real estate managers have money to burn, industry insiders say. While there are differences between now and 2007, in both years there was a "huge amount of capital on the private side," said Brad Case, Washington-based senior vice president, research and industry information at Nareit. "Now REITs are undervalued. It's a great time to buy a REIT, but it can be difficult because REITs don't want to sell at a discount," Mr. Case said. In 2007, REITs were overvalued, he noted. "Blackstone paid an enormous premium to buy EOP," Mr. Case said. "A privatization offer is likely to be accepted if it represents a premium to an already-high valuation," Mr. Case said. "If, on the other hand, an offer is a premium to a depressed valuation but a discount to a correct valuation then it's not likely to be accepted." It's not just money managers that are in the market to acquire REITs and other real estate operators; institutional investors also are buyers. The $37.8 billion Arizona State Retirement System, Phoenix, in April announced a $550 million acquisition of a 50% stake in apartment investor and operator Mill Creek Residential Trust LLC. Also this year, Montreal-based Ivanhoe Cambridge, the C$60 billion ($46.4 billion) real estate subsidiary of Caisse de Dépôt et Placement du Québec, joined with Blackstone Group to take private the Canadian industrial REIT Pure Industrial Real Estate Trust. Last year, Ivanhoe Cambridge joined with Greystar Real Estate Partners to acquire multifamily REIT Monogram Residential Trust Inc. Also last year, the C$356.1 billion Canada Pension Plan Investment Board, Toronto, bought Parkway Inc., an office REIT, for $1.2 billion. More REIT privatizations and acquisitions are anticipated, industry insiders say. Gil Menna, Boston-based partner and co-chairman of the REIT and M&A practice at law firm Goodwin Procter, said that REIT acquisitions are an attractive investment these days. Private equity and real estate managers have raised a good deal of capital and a REIT privatization is an "efficient way to deploy capital," Mr. Menna said. These transactions are the result of a combination of dry powder and REITs' discount compared to the value of the underlying real estate they hold. What's more, it's not easy being a REIT. "There's an odd dynamic just now," Mr. Menna said. In 2013, REITs underperformed because interest rates increased and there was a big increase in the 10-year Treasury rates, he said. In 2017, the 10-year Treasury was basically flat but there was still a big difference between REIT performance and the performance of the S&P 500. The lack of REITs' earnings growth compared to other sectors in the broader market, among other things, is depressing REIT valuations and "causing a downdraft in the REIT sector," Mr. Menna said. These same factors also are causing "private equity managers to be interested in the arbitrage," Mr. Menna explained. Even so, private equity and real estate money managers are not interested in just any REIT, he said. They are only shopping for a few sectors they expect are poised for growth such as industrial, student housing and digital properties such as data centers. "Industrial is an attractive asset class right now," said Lew Friedland, Dallas-based managing director and head of U.S. industrial at Colony Industrial, real estate manager Colony NorthStar Inc.'s industrial business. Colony Industrial was formed as a result of Colony's 2014 acquisition of Mr. Friedland's former firm, Cobalt Capital Partners which operated a private industrial REIT along with former part-owner USAA Real Estate Co. Colony Industrial invests in light industrial buildings. Right now, there is a great deal of demand for industrial properties but a relatively small amount of supply, Mr. Friedland said. There are very few warehouses being built, he said. Real estate managers have a lot of capital, with much of the money being raised by managers that have strong brand recognition, said Lori Campana, Boston-based managing director at alternative investment fund placement agent Monument Group Inc., speaking about the real estate fundraising environment in general. "The hard part is that there is a lot of dry powder sitting with investors' existing managers and those managers are sitting on the dry powder … It's hard to get a deal at a price that is a good price in today's market," Ms. Campana said. "You have a lot of large funds looking at big deals … and where they are going to invest that capital." Even with all the capital available, managers are being cautious and have resisted overpaying or overleveraging investments, she said. Many managers that have deep industry knowledge approach owners of assets they would like to buy, rather than waiting until the property or portfolio is put on the market. Sources said this is happening in the REIT sector, with activist and other investors making unsolicited bids. The still-fought-over privatization of hotel REIT LaSalle Hotel Properties was launched by an unsolicited bid from Pebblebrook Hotel Trust. LaSalle agreed to accept a rival bid May 20 from Blackstone. After the deal with Blackstone was announced, real estate research firm Green Street Advisors LLC released a report stating: "This news comes two months after LaSalle was 'put into play' as a result of a takeover proposal from peer, Pebblebrook." But Pebblebrook's efforts didn't end there. On June 11, Pebblebrook sent an offer letter to LaSalle Hotel Properties' board with a revised merger proposal increasing its bid, which the LaSalle's board rejected on June 18 when it reaffirmed its support for the Blackstone transition, according to a written statement from LaSalle. Blackstone's current deal to acquire Australia REIT Investa Office Fund also was touched off by an unsolicited bid on the part of Blackstone a month before the deal was announced, sources said. Blackstone Group officials declined to comment for this story.